AUSTIN -- Animal rights activists met at the Texas Capitol Saturday in an effort to put a stop to what they feel is unnecessary shooting of dogs by law enforcement. The event, entitled "Stronger Laws For Paws," calls for action to be taken against officers involved in these types of shootings. Julian Reyes, one of the organizers of the event, said they want to see officers who are accused of shooting a pet while out on a call put on administrative leave. "It's important because dogs are family, and we want to protect our family members," Reyes said. Reyes said he just filed a civil suit because he alleges an officer shot his dog two years ago. More recently, a Travis County deputy constable allegedly shot and killed a dog in North Austin this January. Reyes said these incidents must come to an end. "It would be nice if maybe we could get more training, for the police to know what to look at and what dogs are aggressive, key points and stuff like that," said Chris Hankinson, a rally attendee. Some departments have already implemented training measures. In Leander, police hired a canine aggression expert for an 8 hour training course after an officer allegedly shot a dog there. 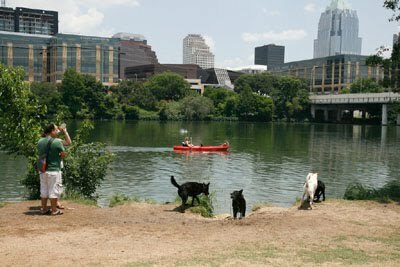 And Austin Police have completed a two hour training course on what to do if they're approached by an aggressive dog. The same group hosted a march in Houston on Saturday as well. KVUE reached out to local law enforcement for comment today, but did not receive a response.